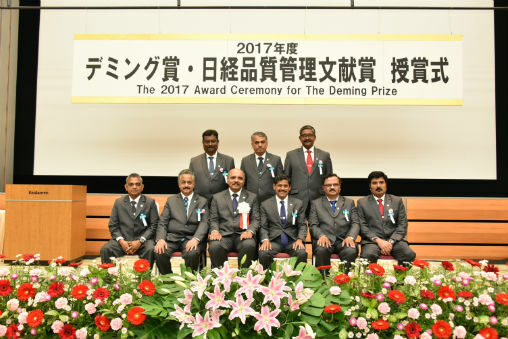 Chennai: Ashok Leyland, flagship of the Hinduja Group, yesterday received the prestigious 2017 Deming Prize for its Hosur Unit II manufacturing facility. The Deming Prize is one of the highest awards on Total Quality Management. It is a global award which is the oldest and most widely recognized award in the world, given to companies that have established customer oriented business objectives and strategies, and implemented Total Quality Management (TQM)to achieve them.In 2016, Ashok Leyland Pantnagarplant had become the first truck and bus plant in the world and also the only CV manufacturer outside of Japan to win this coveted award. With the Hosur unit II plant winning this year, Ashok Leyland becomes the only CV manufacturer outside of Japan to achieve this feat consecutively.